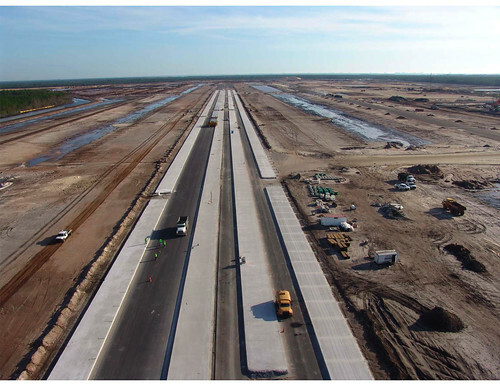 Construction at the new Panama City-Bay County International Airport continues to run smoothly and is currently about 3 and a half months ahead of schedule. The entire project is about 35% complete, with the heavy civil portion, which includes the main runway, approximately 66% complete. In general, almost 250 workers are regularly onsite each work day. Offsite quarries, asphalt plants, concrete pipe plants, truck drivers and other ancillary activities will normally employ another 350 people in significant activity. The foundation for the terminal building is underway with concrete being placed in the footers. Foundations are also underway for the various support buildings and the air traffic control tower. Concrete is being produced by local plants (offsite). Approximately 40,000 tons of asphalt has been placed on the project to date. Contractors are currently paving the main apron areas. Sands and fine aggregates are obtained from local sources while harder aggregates come from mines in Alabama and Marianna, Florida. Asphalt is mixed by CW Roberts in their Freeport and Panama City plants. Approximately 55% of the main runway’s 15? concrete paving lanes are now in place. Aggregates for the concrete are being sourced from local sand quarries and hard rock mines near Perry, Florida. Concrete is being placed by a team of local contractors that includes operators, finishers, and detailers. To date 5.4 million cubic yards of earth has been moved on the project site. Approximately 33,000 linear feet of reinforced concrete pipe has been produced locally and installed by the area’s contractors. Over 40,000 linear feet of high-density plastic underdrains have also been installed. Other local contractors are involved with providing dewatering pumps, erosion control and grass seeding. Work on the underground utilities portion of the project is expected to begin on January 5, 2009. Thank you for the outstanding job with the PCB Daily. It is the best source of accurate and timely information on developments in the area. You have done an excellent job of researching and distributing information that is unbiased and in a manner that is truly a powerful and beneficial stimuli in itself. We greatly appreciate the hours and effort you have committed to the site. Wow, Bob, thanks so much for the kind words. I greatly appreciate your comment. Thanks for reading! I don’t want to be accused of copying someone else’s comments and there aren’t any words to improve on the comments by Bob Douglas, therefore I will simply say I agree 150%. I look forward to your unbiased reporting. Please keep it up. Happy New Year.